"About sunset we made a stand, when I was wounded, having a Ball with the Wad shot through my left forearm & the fuse set my coat and shirt on fire." So wrote Major Joseph Bloomfield in his journal on September 11, 1777, describing his experiences during the hard-fought battle of Brandywine. Bloomfield was an officer in the 3rd New Jersey Regiment from 1776 to 1779. His service took him from Fort Stanwix to Fort Ticonderoga in New York, to the battle of Brandywine in Pennsylvania, and to the battle of Monmouth in his native state. He later served as governor of New Jersey from 1801 to 1812. A compassionate officer admired by his men, Bloomfield carefully recounted the hardships of military campaigns-the swings of morale, the shortage of supplies, the ever-present illnesses-and the intensity of combat. Of special interest are Bloomfield's important notes on the culture and behavior of the Iroquois tribes known collectively as the Six Nations, which played a crucial role in revolutionary New York. Unpublished and all but unknown when the first edition-skillfully edited by historians Mark Edward Lender and Joseph Kirby Martin-appeared, Bloomfield's wartime journal was praised for providing both scholars and general readers with new information on the Continental soldier; the revolution's impact on society; warfare in New York, New Jersey, and Pennsylvania; and the motives and actions of the revolutionary generation. Soldiers and civilians, Patriots and Tories, come alive in this fascinating eyewitness narrative. 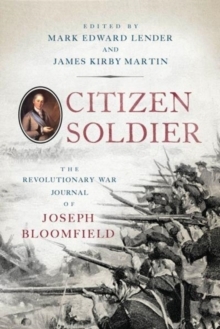 This new edition of Citizen Soldier: The Revolutionary War Journal of Joseph Bloomfield-the first in thirty-five years-includes a new introduction and bibliographic essay by the editors.